This post will list my Sarasota fishing articles. Fishing Lido Key has over 45 posts and articles written to help anglers catch more fish in Sarasota and in Florida. Capt Jim Klopfer has been a fishing guide in Sarasota since 1991. The articles are all 2000 words or more and full of great fishing pictures and techniques. Clink on the title to link to the full article. 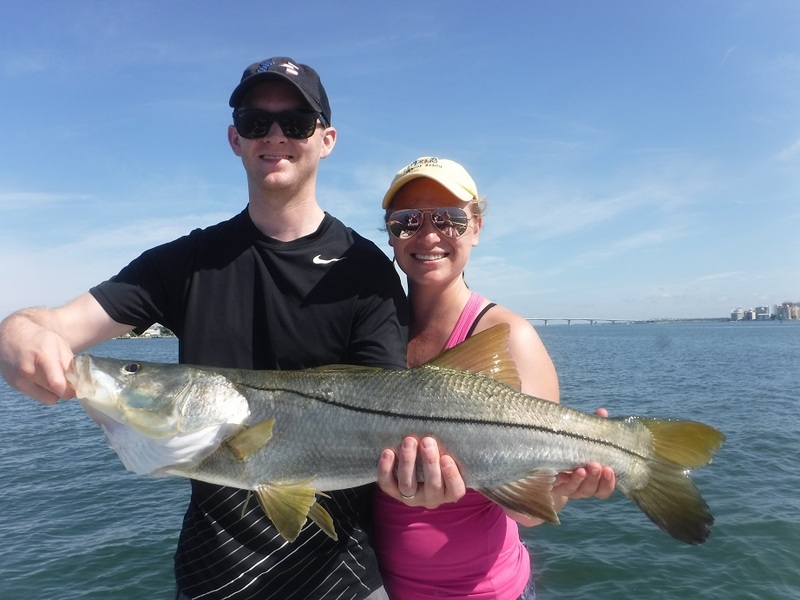 Snook are the premier inshore game fish in Sarasota. They are a terrific game fish that grows large and will hit lures and live baits. These articles outlines the seasonal movements of snook along with the techniques, baits, and lures used to catch these apex predators. Jigs are a simple yet extremely effective fishing lure. The lead head jig with a grub body is the most popular lure in Florida. They catch a wide variety of species and are deadly on speckled trout and other fish found on the deep grass flats. This post thoroughly covers the different types of jigs and techniques used to be successful. Trolling is a very effective technique, especially for Spanish and king mackerel. While it is simply moving along at a slow speed while dragging lures behind, there is much more to it than that. Learn how to do it in this article. The inshore waters of the Gulf of Mexico off of the Sarasota beaches can provide world class fishing when conditions are optimum. Spanish mackerel, king mackerel, false albacore, cobia, tarpon, and sharks are all available in spring and fall. This article covers the baits and techniques needed to be successful. This article highlights the excellent fishing that clients experience in the summer. It is hot, but the action can even be hotter. The key to this action is the abundance of live bait. Anglers reading this article will get all the information they need to experience great success when fishing in Sarasota in the summer time. This article focuses on the top 8 inshore species available to Sarasota anglers. Snook, speckled trout, redfish, Spanish mackerel, pompano, jack crevalle, bluefish, and mangrove snapper are the top species. Learn the lures and baits along with seasons and techniques used when targeting these species. This article is a list of Capt Jim’s top fishing spots in Sarasota. It includes maps with details on species, baits, and seasons. These are the spots that he fishes on a daily basis. This post outlines all of the available options to clients who are thinking about going out on a Sarasota fishing charter. It includes the species available along with the best seasons and techniques used to target them. There are several rivers that are a short drive from Sarasota. The Myakka River, Manatee River, and Braden River all offer anglers the chance for trophy snook and jack crevalle, along with other species. Cooler months are the time to fish Sarasota area rivers. This article shares tips, techniques, and seasons for anglers to be successful fly fishing for snook, jacks, bass, and other species in Sarasota area rivers. Most of this action takes place in the cooler months. Plugs are very effective and versatile artificial lures. They mostly imitate bait fish. They can be cast as well as trolled. Most game fish can be taken by anglers using plugs including snook, jacks, trout, mackerel, bluefish, and more. This article covers the different types of plugs in the techniques used to employ them. Artificial lures catch a lot of fish. Lures can actually catch more fish and live bait under certain conditions. They can aggravate and excite fish into biting when they are not hungry. This article outlines the best six lures to use in Sarasota for a variety of species. Red tide is a naturally occurring algae bloom that happens occasionally in Sarasota waters. If it is bad enough, it will kill fish. However, fishing can still be productive, it just requires a change in tactics and locations. This article will help anglers adapt to red tide and catch more fish. Anglers can catch a wide variety of species when fly fishing in Sarasota. Speckled trout, mackerel, and bluefish will be caught on the deep flats. Snook and jack crevalle can be caught in creeks and rivers in the winter. This article outlines the tackle, flies, and tactics used to be successful. Most anglers visiting Sarasota think of saltwater fishing, and for good reason. However several small lakes and rivers in this area offer good freshwater fishing as well. Crappie, bream, bass, catfish, and other species are plentiful. This article outlines the bodies of water that are productive and the techniques used to catch freshwater fish in Sarasota. Longboat Key is a barrier island on the north end of Sarasota. It is a bit quieter than Siesta Key and Lido Key. The nearby flats and inshore Gulf of Mexico provide excellent fishing for guests visiting Longboat Key. This post will outline the options for anglers contemplating a fishing charter. Speckled trout are an extremely popular inshore game fish in Sarasota and the Southeast United States. They are plentiful, pretty, aggressive, easy to catch, and taste great. Speckled trout can be caught using a variety of techniques and this article outlines the methods used along with the locations to catch speckled trout. Spanish mackerel are a terrific and underrated game fish. They are usually plentiful off the Sarasota beaches in the spring and again in the fall. They can often time be seen feeding ferociously on the surface. This article goes into detail on the baits, lures, techniques, seasons, and locations used to catch Spanish mackerel. Mangrove snapper are a much desired fish species for anglers fishing in Sarasota. They are feisty fish that school up in large numbers. While they can be taking using artificial lures, most are caught on live bait. Snapper are usually found around structure. They are one of the finest eating fish caught anywhere. Sheepshead are a member of the Porgy family. They show up in Sarasota waters around Christmas and stay until Easter. They are staple for charter boat captains in the winter as they are plentiful in fairly reliable. Sheepshead are a structure oriented bottom fish that feed mostly on crustaceans. They are great eating but difficult to clean. This article shares the tips and techniques required to catch sheepshead. Pompano are an extremely desirable species in Sarasota and throughout all of Florida. While small, they put up a terrific fight for their size. They are caught in the bays, passes and inlets, and off the beaches. Many pompano are caught using live bait, but just as many are caught by anglers using jigs. Pompano are fantastic eating! Learn the tips and techniques used to catch them here. Many northern anglers are very familiar with this popular freshwater panfish. Florida has excellent populations of crappie. Several local Sarasota lakes offer visiting anglers the opportunity to catch crappie. Late fall and winter are the best times. Read this article to learn the baits, techniques, seasons, and locations that will help anglers catch more crappie. Anglers from the Northeast part of the United States are very familiar with bluefish. While the bluefish we have in Sarasota and other parts of Florida don’t get as large, they are great fun especially on the light tackle that we use. Most bluefish are caught by anglers casting jigs and other artificial lures. This post will run through the lures, baits, and techniques used to catch bluefish. This post is updated every week or two by Capt. Jim. It gives honest information on the current conditions along with a recent fishing report. The Sarasota fishing report includes species caught, locations that help fish, and lures and baits that were productive. The Sarasota fishing forecast and Sarasota fishing calendar are posts that will help visiting anglers plan their trip to Sarasota. While every year is different, seasonal patterns have emerged. Capt. Jim has been guiding since 1991 and shares his experiences over those years in these posts to help anglers get an idea of what species are available at certain times of the year. False albacore, also known as Bonito, are tremendous game fish! They do not come into the bays but are caught in the inshore waters of the Gulf of Mexico off of the Sarasota beaches. Spring and fall are the best times to find them. Much of this is sight fishing as the fish feed voraciously on the surface. This article will run through the lures and techniques used to catch false albacore. Jack crevalle are a very hard fighting game fish. They are very wide with deeply Fort tales and they use these attributes to pull incredibly hard. Jacks school up and are usually very aggressive once found. They are often times seen feeding on the surface. The largest jacks of the year are found in the cooler months in creeks, rivers, and residential canals. This article covers all aspects of fishing for jack crevalle in Sarasota. One great aspect of being a charter boat captain in Sarasota is that it does not take experience or great skill to have success when fishing in Sarasota. Many of the species are caught on the bottom or in open water, eliminating the need for great casting skill. Also, many Sarasota saltwater species are fairly aggressive and easy to hook. This post goes through all the options that client seeking a family fishing charter can choose from. Tarpon are considered by many to be the ultimate game fish. They grow to over 200 pounds and the experience of hooking one is amazing. Tarpon show up in Sarasota off of the beaches in early May and stay until late July. This article covers all the basics of tarpon fishing including baits, tackle, seasons, and techniques. Sarasota is not known for its freshwater fishing, or its bass fishing. However local area rivers, lakes, and ponds offer visiting anglers the opportunity to catch bass all year long. Sarasota does not have a trophy bass fishery, it is more about action and numbers. This article goes through the options anglers targeting largemouth bass in Sarasota have. Snook migrate up into area rivers in the winter. They do this to escape the harsh conditions on the shallow grass flats. Snook cannot tolerate water temperature below 60° for very long. Anglers casting artificial lures to shoreline cover catch some trophy fish. This type of fishing is best suited for more experienced anglers. This article covers the lures, locations, season, and techniques to catch river snook. Siesta Key is famous for its world-class beaches and powdery white sand. However, visiting anglers enjoy some excellent fishing as well. Options abound for clients of all ages and skill levels. This article goes through the species, seasons, and techniques used to catch the many different species available for anglers interested in going out on Siesta Key fishing charters. Chumming is the act of putting food into the water to attract fish. It is an age-old technique that is still effective to this day. Like other forms of fishing, there are nuances and techniques that will produce more fish. This article goes in-depth into these techniques. Redfish are an extremely popular game fish all along the coastline of the Southeast United States. Most redfish are caught on the shallow flats and around oyster bars, docks, and other structure. They will hit a variety of artificial lures and live baits. This article covers catching redfish in Sarasota and other locations. Sarasota County has an extensive artificial reef program. This article covers the best 11 fishing reefs in the inshore waters of Sarasota. Included are GPS numbers for the locations as well as seasons, species available, and techniques used to catch a variety of game fish on the Sarasota artificial reefs. Bottom fishing is as simple as it gets. Hooks are baited with shrimp or other live or frozen bait and then drop to the bottom on or around structure. However, there are tips and techniques which will help anglers be more successful. This article covers the rigs, tackle, baits, and tactics use to be successful when bottom fishing in Sarasota. These comprehensive posts will answer any questions a visiting angler who is contemplating a fishing charter while in Sarasota, Florida. It covers the seasons, techniques, fishing options, and much more. Sarasota Bay offers anglers the opportunity to catch over 20 different species throughout the year. These articles covers those species along with the locations that they are found and baits and lures used to catch them. This post simply lists the videos that Capt. Jim has made for his YouTube channel. The short videos are informative and cover a wide range of angling opportunities in Sarasota. This very long and comprehensive post covers all of the inshore and nearshore angling opportunities for those visiting Siesta Key who might be thinking about doing some fishing. There’s a ton of great information on fish species, locations, seasons, baits and lures, and techniques used that will help anglers be successful. Jacks are terrific game fish, and are a great challenge for anglers casting a fly. A large Jack will put up a great fight on fly tackle. This article covers the tackle, flies, techniques, and locations used to catch jacks on fly. In conclusion, this list of Sarasota fishing articles has a ton of great information that will help anglers catch more fish!